At the risk of sounding like a kooky hippie, I'm going to share something with you: I have an astrologist. She is awesome*, and I usually see her once a year, to check in on what's going on in the universe and how it's affecting me. I met with her tonight, and she had a lot of good news for me, which was welcome, considering I've been feeling a little stuck lately. Going over my chart always leaves me hopeful and eager—it's not necessarily predicting the future but guiding me through it. If you've never had your chart done, I'd highly recommend it; you get a much richer sense of things than simply reading your moon sign. On the most basic level, I'm a Pisces, which is the sensitive, intuitive, creative sign, and its symbol is two fish swimming in opposite directions, which I find oddly meaningful. 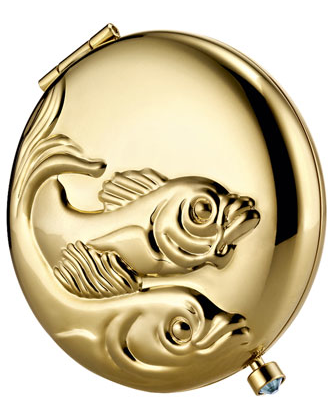 So it makes sense that I tend to be drawn toward Pisces-themed items; I've wanted an Estée Lauder zodiac compact for years. Filled with translucent powder and finished with a jeweled clasp, it's an incredibly elegant way to powder your nose. So I may be a kooky hippie, but at least I'll be a glamorous one. *If you're interested in meeting with her, email me and I'll send you her info.